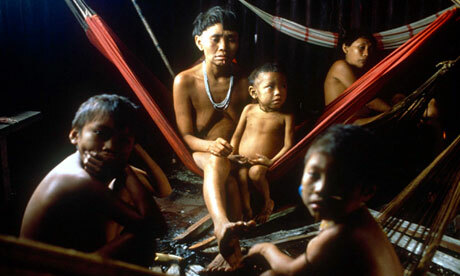 Logging in the Brazilian Amazon has had a devastating effect on the rainforest and its indigenous people. However, a new operation by the army, air force and military police is designed to save an endangered tribe – by keeping loggers off their land. It took Pira’I two small steps to get up into the helicopter, but those steps bridged two completely different worlds. Pira’I is a member of a 350-strong tribe called the Awa. They live in the last islands of rainforest in what is now the extreme eastern edge of the Amazon. He grew up in a tiny nomadic tribal group, completely separate from the rest of the world. Now, together with his friend Hamo, he was taking his first ever flight, leaving the jungle where they have lived all their lives. They gave me a nervous smile through the window, then the engine roared and their faces vanished in a great eddy of leaves and dust as the helicopter rose up into the air. This was a momentous trip for them, and for the entire tribe. 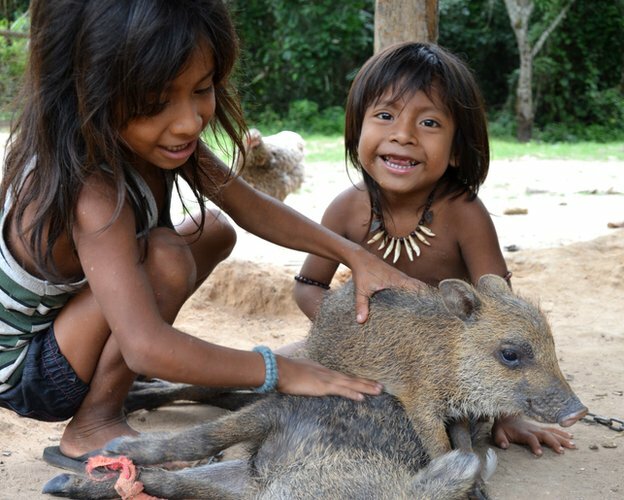 The Awa are one of very few hunter-gatherer communities left in the Amazon basin. Survival International, a pressure group that campaigns for the rights of indigenous people, has described the Awa as “the most endangered tribe on the planet”. Over the last couple of decades illegal loggers and farmers have invaded their ancestral lands, destroying the forest. I’d asked Pira’I what it was like growing up in the forest. Pira’I and his family – like most of the Awa – were forced to give up their traditional lifestyle and move into villages. Incredibly, though, a few dozen Awa are holding out. 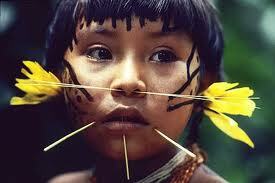 They remain uncontacted, living in the last stands of jungle in this region. “It is a miracle they are not dead,” one of the officers of Brazil’s Indigenous People’s Department, Funai, tells me. With his extravagant beard, Leonardo Lenin, lives up to his dramatic name. 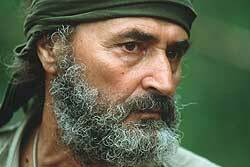 He has dedicated his life to fighting on behalf of the tribal people of Brazil. “This is a story of resistance,” he says. And, thanks to the efforts of people like Leo Lenin and Survival International they are now much more likely to do so. That’s because for once there is some good news from the Amazon. I had come back to witness the Brazilian government’s unprecedented effort to drive out the invaders and to take back the tribe’s ancestral lands. It is called Operation Awa and is on an impressive scale. 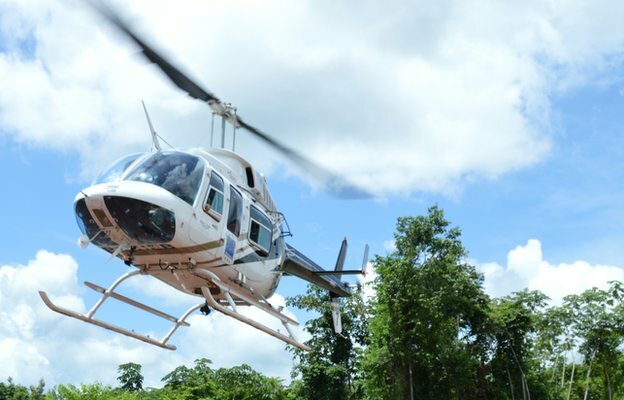 The Brazilian army, air force and military police are working alongside Brazil’s environmental protection service. The operation is co-ordinated by Funai. Farmers who have illegally settled on the indigenous reserve that comprises the Awa’s territory, have been served notice to leave. And they seem to be doing so. The government has offered them plots elsewhere in the state. I watched a family load up a truck with everything they own – including the tiles from the roof of the farm they’d lived in for 18 years. The discovery of an indigenous girl’s body hanging from a tree in Bororó de Dourados was as grim as it was familiar for Brazil’s Guarani-Kaiowá tribe, which has one of the highest suicide rates in the world, according to a new report. Ahead of World Mental Health Day on Thursday, figures from Survival International suggest that the Guarani-Kaiowá are 34 times more likely to kill themselves than Brazil’s national average. This has prompted warnings that a “silent genocide” is under way. The community of 31,000 people, mostly based in the south-western state of Mato Grosso do Sul, is plagued by alcoholism, depression, poverty and violence after losing its ancestral lands to ranchers and biofuel farmers. The problem is decades-old, but Survival says the rate has increased in recent years. Since the start of the century, one suicide has been reported on average almost every week. Almost all are hangings, with ropes, belts or cloth. Most are young. The latest victim, on Wednesday, whose name has yet to be released, was a 17-year-old girl. Last week, a 16-year-old, in Dourados reserve and a 19-year-old in Amambai reserve killed themselves. “The principle reason is their lack of land,” said Mary Nolan, a US nun and human rights lawyer. “The Guarani people think their relationship with the universe is broken when they are separated from their land. They feel they are a broken people.” Many in the community cosmologically interpret their situation as a symptom of the destruction of the world. As well undermining their spiritual base, the seizure of their land by farmers has disrupted the social structure of the community. Traditionally, disputes between families were settled by one side moving away and starting again in a new territory. 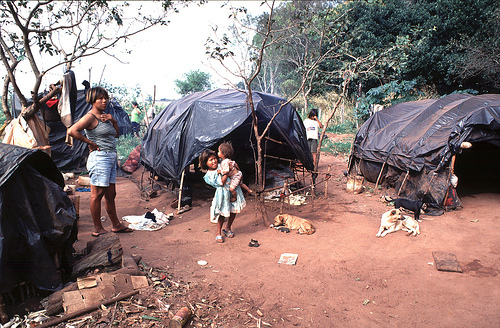 But this is no longer possible now that thousands of Guarani are crammed together in camps. One camp in Dourados now has a murder rate that is more than 50% higher than that of Iraq. The stressful, violent environment is worsened by beatings and assassinations of indigenous leaders who try to reclaim their land from wealthy farmers. The suicides began among the first generation to grow up on reservations, which the tribes moved into in the 1970s, according to Guarani ethnologist, Tonico Benites. With the world’s economic system in a shambles, the price of gold is rising making it more lucrative to exploit protected areas in the unscrupulous grab for the precious metal. Brazil is pressing Venezuela to determine whether Brazilian gold miners crossed the border and massacred a village of about 80 indigenous people from a helicopter. The alleged assault, which a tribal group says could have killed more than 70 people in early July, came to light earlier this week when the group asked Venezuela’s government to investigate. Because of the remoteness of the region and the scattered nature of the native settlements, fellow tribe members were able to alert the government only on Monday. Brazil’s foreign ministry said on Friday its embassy in Caracas had asked the Venezuelan government to provide it with any information that could help it determine whether the attack had happened and whether Brazilians had been involved. Brazil’s National Indian Foundation, a government body that oversees indigenous affairs, said it would seek a joint investigation by officials from both countries at the site. The border area between the two countries – a long, dense swath of the Amazon rainforest – has increasingly become the site of conflicts between indigenous people, gold miners, and others seeking to tap jungle resources. 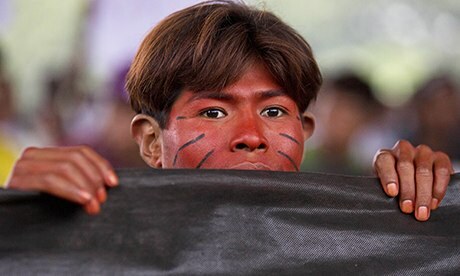 The tribe that was allegedly attacked, the Yanomami, says it has given repeated, but unheeded, warnings to Venezuela’s government that the conflicts are intensifying. No, it’s not Superman, nor any other caped crusader. According to Time Kids magazine and the UN, it is Sydney Possuelo. 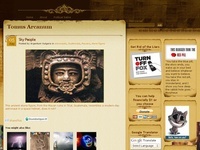 Sydney Possuelo is one of the very last explorers. He is Brazilian. In 2006 he was sacked by FUNAI (the Foundation for Indian Affairs) because he spoke the truth. He criticised the FUNAI president, Mércio Pereira Gomes, for saying during a press interview that “Indians had too much land,” a position that was totally incompatible with his position as protector of the same. To Possuelo that statement was frightening. It was exactly what the farmers, ranchers, goldminers and loggers have been saying for years as they massacred, stole, deforested and raped Indian lands. The position was official, even confirmed by Brazil’s then president Luis Ignacio Lula da Silva. 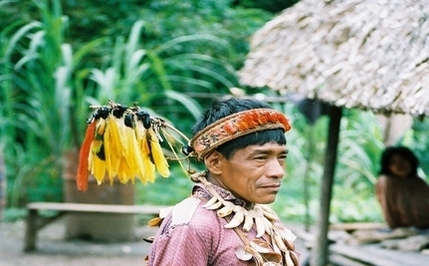 The Brazilian government had admitted it was anti-Indigenous people. But that’s enough of the ‘official’ stuff. You can read more about Sydney Possuelo’s life and works. This concept is so dear to my heart and thinking. The indigenous people of the world are the ones, the only ones that have a right to their lands. The white invaders, the interlopers are the barbaric ones who came and plundered and slaughtered. It was the whites that brought diseases against which the indigenous peoples had no defences. It was the white who told them they were naked. It was the whites who decimated these people in the name of religion. I agree with Sydney Possuelo, leave these people in peace, leave them alone, leave them to live their lives without further interference. Haven’t we already done enough damage? When the Portuguese “discovered” Brazil this country was already inhabited by 2 million indigenous people. São Miguel das Missões (Portuguese for St. Michael of the Missions) is a Unesco World Heritage site located in the small town of São Miguel das Missões in the northwestern region of Rio Grande do Sul, a state in southern Brazil. It is also known as São Miguel Arcanjo and by its Spanish language name San Miguel. It was one of the many Jesuit Reductions in Argentina and Brazil. Jesuit missionaries founded the mission in the 18th century in part to catechise the Guaraní indian population and to protect the natives from Spanish and Portuguese slave traders. When I read of the injustices, the massacres and the plight of these peoples I feel sad, more, much more than sad, it reduces me to tears. We call it civilisation, there is nothing civilised about what we have done to these people; we talk about humanity, there is nothing humane about what we have done to these people. Yet we still do it. It began with the Portuguese and Spanish churches, it continues unabated today. We have to satisfy the Western world’s insatiable greed and in doing so we destroy everything that was beautiful around us. The people, the rainforest, the land, everything. Have you ever seen the film The Mission? The film portrays the destruction of the Jesuit missions and the terrible consequences for the indigenous people, it is terribly tragic. And we have never shown any remorse. I suggest that if you want to understand the brutality that we have perpetrated on these peoples, watch it. You’ll watch it and weep. If you don’t shed a tear, then perhaps you need to look deep into your soul. While Brazil looks forward to its future as an agricultural power, many of its rural areas continue to be marred by violent conflicts over land that have continued unchecked from one decade to the next. 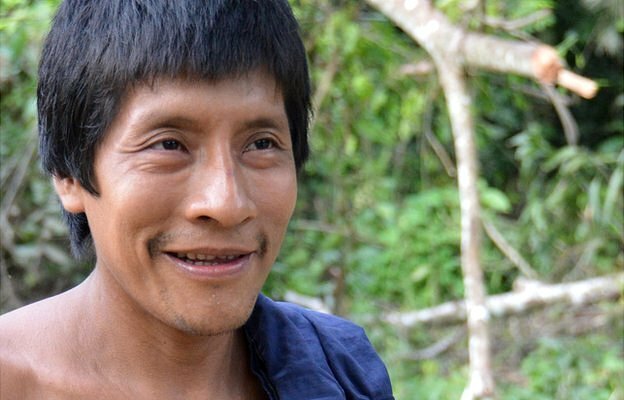 In the state of Mato Grosso do Sul (one of the country’s biggest sources of beef, soy and corn exports) an indigenous tribe located near the border with Paraguay, the Kaiowá Guarani, was attacked this morning by gunmen, according to Cimi, the indigenous missionary council. 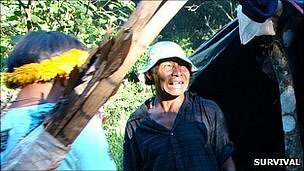 The tribe’s chief Nísio Gomes was executed and his body was taken away on a truck. This follows violent conflict between the Amazonian Indians and ranchers over land. 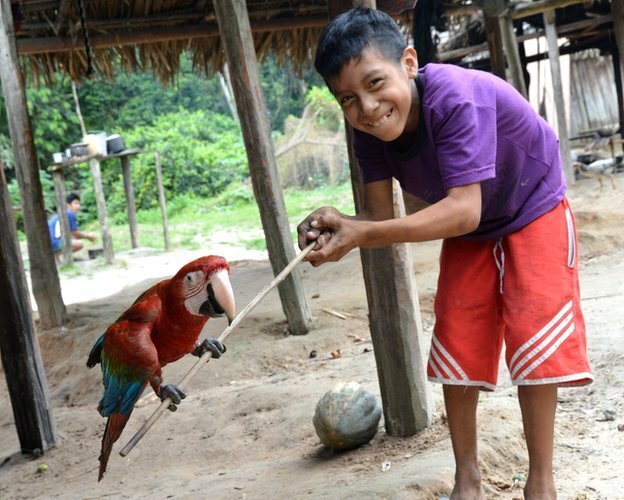 Earlier this year in Acre, an Amazonian state bordering Peru, a Peruvian paramilitary group surrounded the area where an isolated indigenous tribe lived, possibly in the attempt to massacre them, according to Funai, the indigenous national foundation. This comes at a time when Brazil and Peru are investing in big infrastructure projects. One of these, the proposed inter-oceanic highway, is expected to cross Acre, providing access to the Pacific Ocean and the vast market beyond of China for agricultural exports from the state. But the road could also facilitate drug trafficking in the region and pilfering of land by ranchers and illegal settlers. Indigenous populations are not the only victims of violence caused by land conflict. According to the Pastoral Land Commission, a rights group tied to the Catholic church, land conflict in 2010 was the direct cause of 34 murders, 125 death threats and 90 acts of violence against independent activists, small landholders and members of Brazil’s “landless movement”, a group fighting for agrarian reform. Most of these incidents happened in areas where agricultural projects are expanding. Brazil is aiming to become the world’s biggest agricultural producer. But it should learn from the lessons of the US and others and avoid writing this part of its history in blood. An indigenous leader in southern Brazil has been shot dead in front of his community, officials say. Nisio Gomes, 59, was part of a Guarani Kaiowa group that returned to their ancestral land at the start of this month after being evicted by ranchers. He was killed by a group of around 40 masked gunmen who burst into the camp. Brazil’s Human Rights Secretary condemned the murder as “part of systematic violence against indigenous people in the region”. In a statement, Human Rights Minister Maria do Rosario Nunes said the region in Mato Grosso do Sul state was “one of the worst scenes of conflict between indigenous people and ranchers in the country”. She said those responsible must not be allowed to escape with impunity. Mr Gomes was shot in the head, chest, arms and legs and his body was then driven away by the gunmen, community members said. His son was reportedly beaten and shot with a rubber bullet when he tried to intervene. Unconfirmed reports say two other Guaranis were abducted by the gunmen and may also have been killed. The incident happened near the town of Amambai near the border with Paraguay. Federal Police and representatives of Brazil’s main indigenous organisations have travelled to the area to investigate the killing. “The people will stay in the camp, we will all die here together. We are not going to leave our ancestral land,” one of the Guaranis told the Roman Catholic Indigenous Missionary Council (CIMI) . CIMI said the community wanted to recover Mr Gomes’s body so he could be buried in the land he tried to defend throughout his life. Brazilian indigenous people are forced to live like this while their land is destroyed by ranchers fighting to produce crops for biofuels. The article refers to protestant sects, I wish to comment that these are more likely to be evangelical sects, not protestant. In South America which is predominantly Catholic, anything not Catholic is wrongly classed as protestant, including evangelicals. This problem of identification exists all over South America. Here in Brazil even evangelicals can’t discern the difference and can’t understand it when explained to them. Having lived in Bolivia and Peru, the problem is the same there. The Peruvian newspaper La Republica reported sectas protestantes which is understandably the same mistaken belief meaning they weren’t Catholic. The evangelical churches in South America (and there are hundreds of different sects) have some really weird ideas which thrive in people who lack education.